Quick & Painful Miami Details Announced! 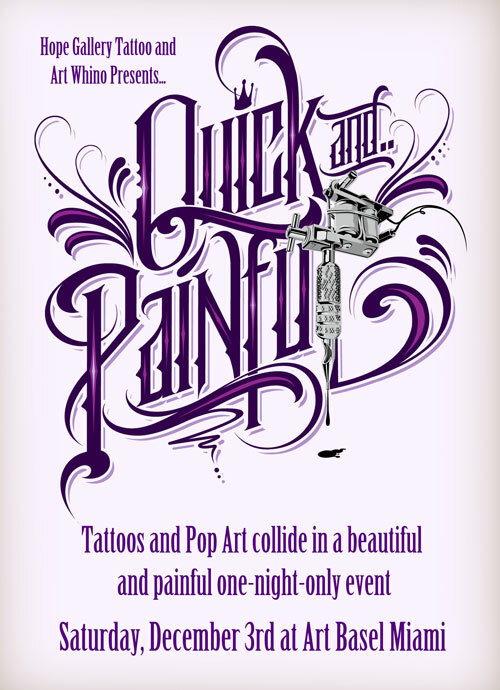 Fine Art Fridays, Tattoosday Comments Off on Quick & Painful Miami Details Announced! 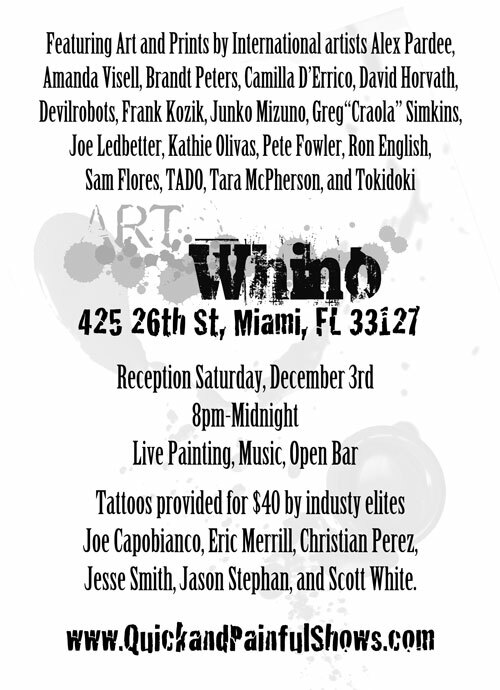 If you are in the area for the famous Art Basel event, head on over to Art Whino at 425 26th Street in Miami FL for the Quick & Painful Art Basel Reception taking place Saturday, December 3rd, 8pm-Midnight. They will be releasing special tattoo inspired flash giclee prints by the World’s most popular lowbrow artists: Alex Pardee, Amanda Visell, Brandt Peters, Camilla D’Errico, David Horvath, Devilrobots, Frank Kozik, Greg “Craola” Simkins, Joe Ledbetter, Junko Mizuno, Kathie Olivas, Pete Fowler, Ron English, Sam Flores, TADO, Tara McPherson, and Tokidoki co-founder and Creative Director Simone Legno. $40 Tattoos will be provided during the reception by industry elites Joe Capobianco, Jesse Smith, Eric Merrill, Christian Perez, Scott White, and Jason Stephan. … is having a party for their 5th Anniversary. Enjoy and Congrats Tattoo Society. Fine Art Fridays, Tattoosday Comments Off on Reclaiming: AMAZING Art Exhibit…. Perhaps my favorite tattoo artist of all time… if not, one of the top… and perhaps more importantly, one of my favorite contemporary artists today… which I think means a lot considering I ain’t no slouch in the realm of contemporary art… I am an art professor for gods sakes. 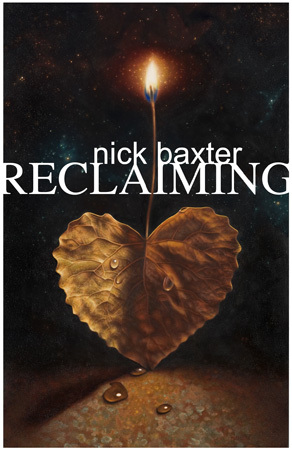 Nisus Gallery is pleased to present Reclaiming, a show of all new works by Nick Baxter. This series of paintings illustrate the recovery of a physical and spiritual connection to the living world. This connection not only supports our existence, but comprises our very bodies and consciousness. Baxter’s technical style, which merges the classic trompe l’œil aesthetic with allegorical themes, lets viewers witness this process of reclamation. Looking for something fun to do this weekend?? 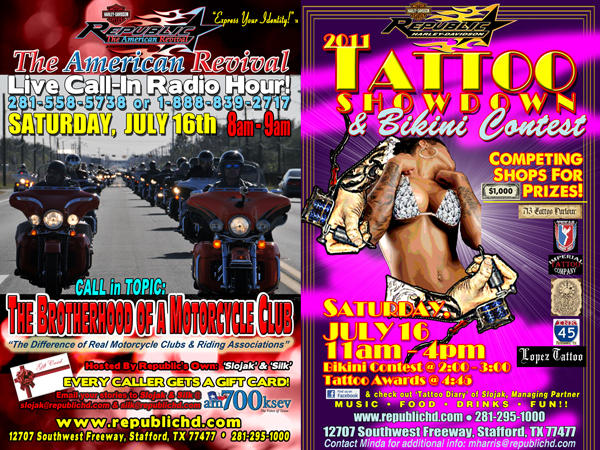 Well, if you are in the greater Houston area, why not stop by Republic HD to check out the live tattooing and the bikini contest? Should be a great time. They have some of the best tattoo artists that Houston has to offer doing work live on the floor for you to watch and vote upon. In fact, you might even see me there… not as an artist, not as a participant, but possibly as a judge. I was just invited to judge and am trying to find a way to swing it… if you see a green Panhead parked out front, you will know I made it. Coming up Saturday is Republic’s annual Tattoo Event and this year is an actual Tattoo Showdown on the showroom floor with Houston’s finest tattoo artist competing for $1000.00 Cash Prizes! 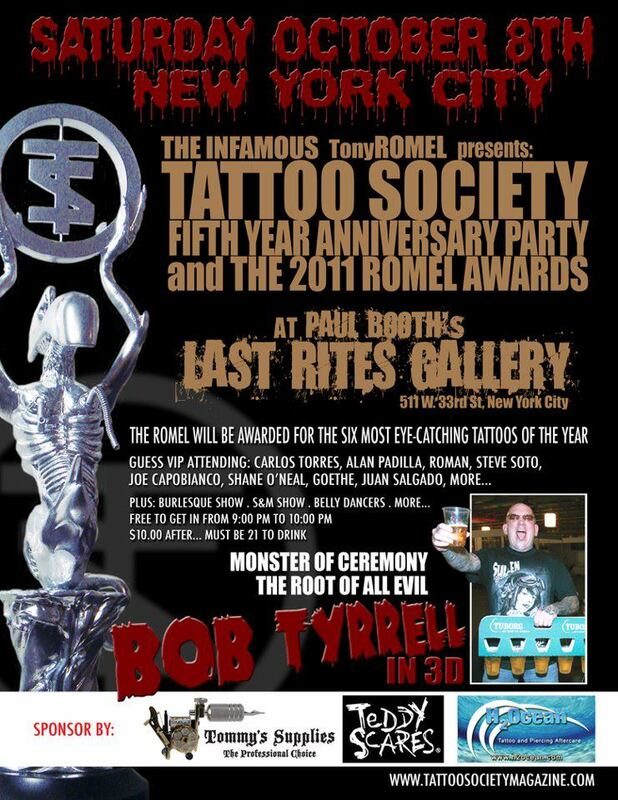 These are true ‘artists’ performing live tattooing with both Judge’s Award and People’s Choice Award. Please see www.republichd.com for all of the information. Ink is permanent and so are life’s memories. I am having my “Tattoo Diary” inked into my arms as ‘sleeves’. These very special tattoos representing the noteworthy events and memories I have experienced in my life with references to loved ones, significant relationships, special pets, and. Of course, motorcycles. Please follow the progress and eventual completion of this project on the REPUBLIC FACEBOOK as I continue this rather bizarre episode in my life or should I say ‘another’ bizarre episode. This outstanding artistic undertaking is the work of George Arenas, of I-45 INK, 8301 Gulf Freeway, 713-941-8787. George listened to my stories and ideas and developed the design from his talents and supporting pictures. All of his work is freehand and exceptional! Of course, the REPUBLIC 2011 TATTOO SHOWDOWN would not be complete without beautiful ladies. 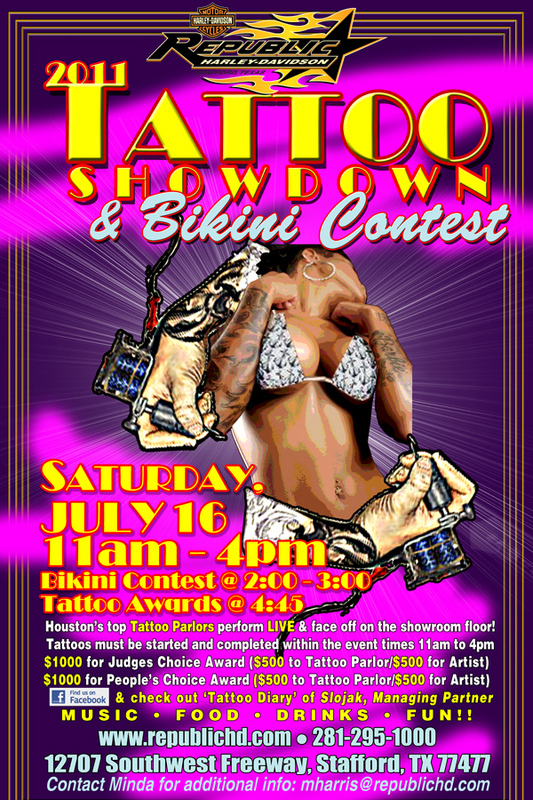 On the same day we are having a Bikini Contest LIVE on the showroom floor! Fine Art Fridays, Tattoosday Comments Off on World’s First Animated Tattoo? Just last month, Paris-based tattoo artist Karl Marc incorporated a QR code into a tattoo which, when scanned, reveals an animated version of a specific segment of the piece. In this case, a rose holds the QR code. Marco, the wearer of the piece, can change where the QR code points so he can swap new animations in whenever he pleases. In fact, he already has a second animation ready to go. The session was streamed live on Facebook as part of a promotion with Ballantine’s, allowing viewers to comment live and talk with Karl as he worked. All I really have to say about it is that I wish I had thought of the idea. I mean, if I had not thought of the actual tattoo idea, then at least to have been around to volunteer to be the canvas. I am pretty impressed with how the technology has been folded into the artwork… the dawn of a new age? QR tattoos are pretty new, but they are out there… now that smartphones can scan barcodes and QR codes, who knows where they will appear… body art is just one facet.